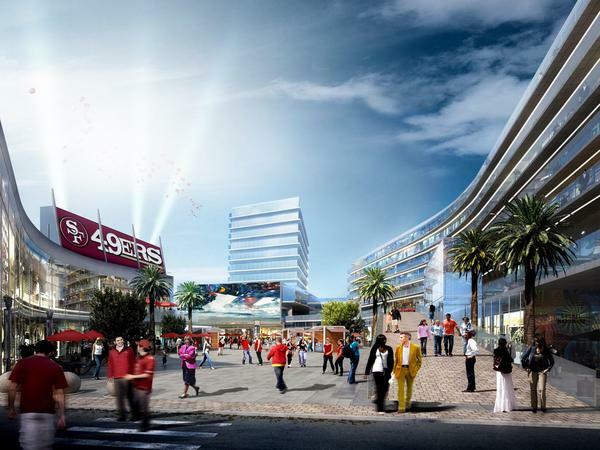 There are plans for two massive development projects around the new 49ers Stadium in Santa Clara. The first is a $1.5 billion dollar project (more than the cost of the stadium) that would include 1.5 million SQFT of retail (this is more retail than all of Valley Fair mall), 2.4 million SQFT of office, a 200 room hotel, and 500 residential units. You can see the first conceptual drawing below and the soonest it would break ground is 2016. The second is a $400 million project led by Joe Montana that would consist of two hotels totaling 235 rooms, 150,000 SQFT of restaurant/retail space, and 430,000 SQFT of office. The first phase of this project would ideally be up and running by the Super Bowl in 2016. While these projects are not directly in San Jose, they may impact San Jose in both positive and negative ways. On the positive side, this could have a catalyzing effect on the whole region and attract more investment dollars to the South Bay, especially North San Jose. Obvious it would give San Joseans a new retail and entertainment anchor to visit. On the flip side, this could draw more tax dollars to the city of Santa Clara and hurt business for the current Silicon Valley retail megacenter: Santana Row + Valley Fair. What do you guys think about these projects? This is not a good thing....especially for downtown. One of the city's selling points for conventions against Santa Clara is the lack of entertainment and retail within walking distance of the hotels and Convention Center. The additional hotels close to the center also negatively impacts downtown. Santana Row will survive and likely up its game. I'm sure the developers for the Winchester Dome lot have competing with Santa Clara in mind. I agree with David, the biggest loser is the SJ Convention Center. They'll compete for smaller conventions, but the SCC is limited by its size. The SJ convention center offers double the space. The size of convention that SJ and SC compete against and that are the bread and butter of both are about the same size. While the expansion of the SJCC has made it possible to host groups that SCCC cannot, those are not bulk. As I've said, our greatest competitive advantage was the lack of things to do in SC and with these projects we loose that. I see nothing wrong with that, except what is being removed to make room for Joe's dreams? Great America? The Convention Center? Intel? This intersectionat first street is vital to many Silicon Valley businesses, and the engineers and technicians who make Silicon Valley happen, need to get to work and do their jobs. Nothing is being removed to make way for 'Joe's dreams', i.e., the Montana/Lowe development. It is proposed on dirt parking lots directly across from the stadium. It's the Related Companies development (the much larger $1.5B project) that would need to displace things - namely, the golf course and BMX/motorcross track that currently lie north of the proposed Montana project. Great America, the SC Convention Center and all the nearby tech offices will be untouched. And regarding getting to work, almost all of the football games at the new stadium will occur on Sundays. Traffic from the other non-football developments -- well that's another story. Overall, you're doing a great job with this blog - keep it up! What an awesome "problem" to have! Oakland Coliseum anyone? What I find interesting is that the Related is considering three department/large format stores. I thought that particular retail sector wasn't active on the expansion front, but if it is indeed, then there is SOME hope that one of these stores at could look at downtown. I disagree. All major cities have "competing" subdistricts. A visitor to SF doesn't stop in Union Square and then head home. They go to the Castro, and the Haight, and North Beach. The key is that they're not competing, they all offer something different and the city becomes greater as a whole. I have to agree with the first post. You cannot compare the standard visitor to SV and SF. Its very different. As long as these mega projects outside the downtown core are continuing to be built it's only bad news for downtown. We need to finally define what downtown is. We either need a mega project to be built to drive in locals (Take a look at what Salt Lake City did with the City Creek Project), or we need to help foster small business and boutiques a la Hayes Valley/Union Street in SF and make it truely unique and local. What David said: "we need to help foster small business and boutiques a la Hayes Valley/Union Street in SF and make it truely unique and local." Just because it bears repeating. The fact remains that the statement "What urban centers have many vibrant and competing subdistrict and have vibrant and thriving downtowns? None" is blatantly false. I agree that this is bad news for the downtown SJ that exists today, however at the very earliest the first phase of the SC project won't be complete for at least 5 years. With the way things have been going in downtown, we should be in a much more competitive position by then. Very good point, by the time this project is up and running Downtown will have hit a critical mass in terms of population and activity. We will have at least 8 or 9 dense residential projects completed by then, perhaps far more.